This blog was written by Lisa Walker, CEO of Ecosphere+, who is attending the annual World Economic Forum meeting in Davos this week. She will be participating in high level dialogues about the global risks and opportunities of taking action on climate change and the vital role of nature, particularly forests, in this fight. This week, the task for over 3,000 leaders across the private sector, governments, civil society and academia meeting in Davos is to help build a new framework for global cooperation in order to preserve peace and accelerate sustainable progress. This is dubbed Globalization 4.0 and requires a fundamental transformation of economies, businesses, societies and politics. Risk resilience through improving collective management of core environmental systems including the climate, oceans and biosphere is one of the key issues of globalization that the WEF has highlighted. Our societies and economies depend on the health of natural systems and are therefore critical to the future of our planet yet to date the role played by nature in regulating the climate and vital ecosystem health that underpins the economy is still seen as a ‘nice to have’ or topic for philanthropy rather than a necessary and now urgent issue for businesses and government. In fact, the outcomes of the WEF Annual Global Risk Report show that risks of catastrophic weather and flooding from climate change are at the top of the list of concerns for business leaders heading into the annual meeting. We must raise ambition to achieve a safe climate, meet globally agreed temperature goals and manage physical and financial risks. Scientists and governments agree that we must aim for a maximum average temperature rise of less than 2oC, with most advocating a maximum of 1.5oC, before the negative impacts of increased greenhouse gas emissions in our atmosphere become too extreme (and too costly) for us to deal with. However, current global government commitments, if implemented, put the world on track for 3oC temperature rise – a huge gap. Natural climate solutions have a critical role to play in this task, they can equate to 37% of the emissions reductions needed to achieve our climate goals and up to 50% of the pre-2020 mitigation required. This includes protecting or restoring our forests, grasslands, wetlands, peatlands, agricultural land and coastal eco-systems. The lowest-cost option is to prevent the conversion or destruction of our natural tropical forests in the first place. 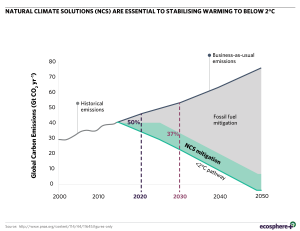 One third of this natural mitigation can be delivered at or below $10 per tonne of CO2e with many positive benefits for communities and ecosystems. This is the same as taking more than 600 million cars off the road, making this a compelling commercial, as well as environmental and social value case. I am hopeful that this week will address not only the concerns we all have around how quickly our climate is changing and how to adapt and mitigate to that, but also focus on the solutions at hand, particularly underlining the value that nature provides, with strong commitments to measurable actions from business and government leaders. I believe we need a new deal for nature and the people that rely on forests, that addresses biodiversity and ecosystem loss, and ensures that the solutions and benefits nature provides are integrated in systemic, inclusive, and transformative actions to benefit human wellbeing, the economy and the planet. This can only be done by a fundamental transformation, embedding the value of nature in society and the economy. At Ecosphere+, we have developed nature-based solutions that enable large organisations through to tiny businesses succeed in a world aligned with global climate and development goals. Micro-carbon pricing is a very clever way of not only accounting for the carbon that services and products accrue, but also engaging customers and staff in taking accountability for their own actions and consequential carbon footprint, building a movement that can scale much more effectively to meet the necessary targets. Currently, social and environmental costs are not accounted for in society and yet every financial transaction has a climate consequence. If we integrate the invisible cost of carbon emissions into everyday purchases, by displaying the true cost of production or “price of carbon”, at the point of sale, consumers can clearly understand the environmental impact of the products and services they are buying and take action. If micro-carbon pricing on individual products is linked directly to protecting critical rainforests and their communities, then, customers not only feel connected to the ecosystems most vital to global climate health, but can make a visible difference. This speaks to the existing and growing consumer preferences for socially and environmentally friendly products. Imagine if the two billion cups of coffee consumed each day were carbon neutral or even climate positive. Every day this would protect about 20 million trees which would avoid the equivalent carbon impact of taking 48,000 cars off the road for a year. Over a whole year, this would add up to over 3 billion trees protected which would avoid the carbon emissions of 9 million homes’ energy use for one year. We do not need to wait for perfect policy mechanisms and intergovernmental agreements, we have the tools available to us now to start, and the science is clear that we cannot wait. 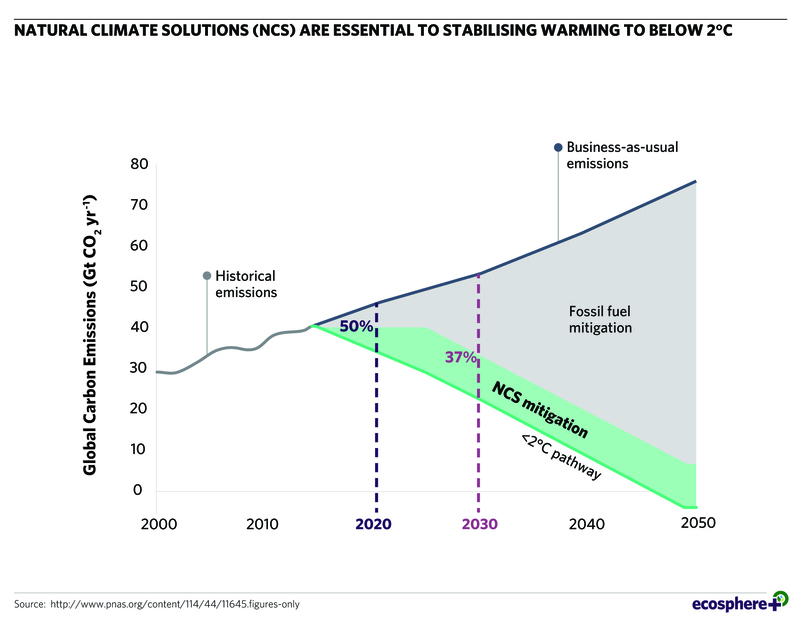 This could form a vital part of the transition to a zero carbon economy and provide vital financing for forests today. Our vision is that all retailers will be able to sell a product and take into account the carbon impact it creates at the same time. Consumers will be able to understand the environmental impact of the products they are buying – both positive and negative – at the point of sale, and will be able to mitigate this in an instant, with millions of micro-transactions scaling up to make a huge collective impact. 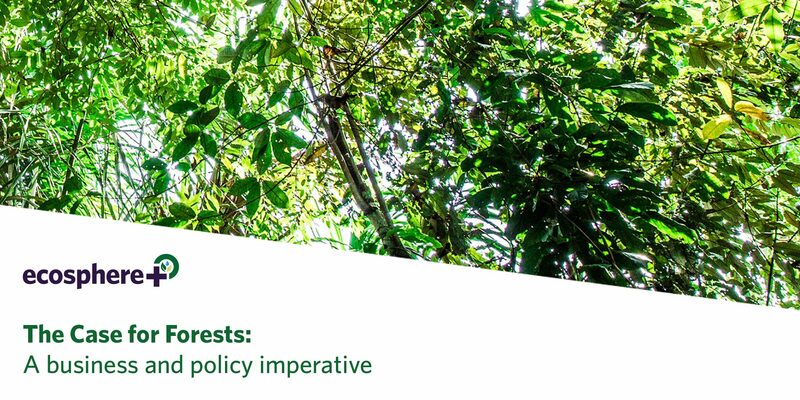 In conjunction with this global meeting, we are pleased to share ‘The Case for Forests’ booklet, which establishes the huge range of critical services that forests provide for the climate and nature, society, and economy. For example, not only do forests tackle climate change by sinking and storing carbon, but they also help communities adapt to the impacts of climate change. Forests also provide habitat for endangered species, resources and livelihoods for local and indigenous communities and ecosystem services such as fresh water for global crop irrigation and clean air. 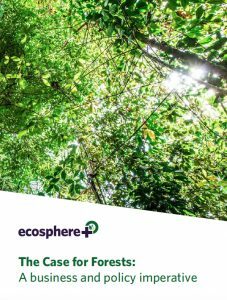 Download the booklet here to learn more and use this information to engage your colleagues or friends on The Case for Forests.